Molecular weight Native human Interleukin-6 is generated by the proteolytic removal of the signal peptide and propeptide, the molecule has a calculated molecular mass of approximately kDa. Recombinant IL-6 is a homodimer protein consisting of amino acid residue subunits, and migrates as an approximately kDa protein under reducing conditions in SDS-PAGE. Biological Activity The ED(50) was determined by the dose-dependent stimulation of the proliferation ofmurineTD1 cells was found to be less than.1 ng/ml, corresponding to specific activity ofx107 IU/mg. Presentation Interleukin-6 was lyophilized from a.2 μm filtered PBS solution pH.0. Inflammatory conditions reduce Imatinib uptake and hMATE1 expression in hRASF. B, C, and D) Effect of 18 hours incubation with a TNFα, IL-1β and IL-6 (+sIL-6R) cocktail and with single cytokines (each at 10 ng/ml) on Imatinib uptake in hRASF , hMATE1-mRNA expression , hMATE1-protein expression by immunofluorescence staining (upper part of D) and by Western Blot analysis of biotynilated plasma membrane fractions hMATE1 (lower part of D showing an example of a typical Western blot together with the quantitative analysis of three independent experiments). After informed consent from the donors, human umbilical cord blood was obtained and used for the development of CBMCs as described previously. Mast cells were either developed by culturing the celltype'>mononuclear cell population for 8–10 weeks in medium'>RPMI medium'>1640 medium supplemented with 10% FCS , 50 ng/ml SCF and 10 ng/ml IL-6 , or by culturing CD34-selected cells in medium'>serum-free medium'>mPro medium supplemented with 30 ng/ml IL-3 (for the first week only), 50 ng/ml SCF and 10 ng/ml IL-6. Mast cell development was evaluated by staining for the mast cell-specific serine proteinase tryptase, as described previously. 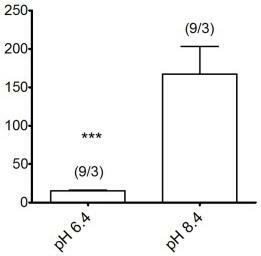 The purity of mast cells exceeded 95% when used in the experiments. The use of CBMCs was approved by the ethics committee at the Uppsala University Hospital. The retroviral construct MSCV-BCR/ABL1-IRES-GFP was kindly provided by Prof. Connie Eaves together with a control vector expressing only GFP (MIG). Ecotropic viral particles were produced by transient transfection into 293T cells. The transductions and transplantation experiments were performed essentially as described by Li et al. In brief, matched Socs2+/+ and Socs2−/− donors were killed and c-kit+ cells were isolated using midi MACS and anti-CD117 micro beads . A total of 400 000 cells per recipient were prestimulated in StemSpan serum-free expansion medium supplemented with 50 ng/ml murine SCF, 10 ng/ml murine IL-3, 50 ng/ml human IL-6 , for 48 h. Transductions were performed by preloading viral particles using Retronectin . Cells for transplantation were harvested ∼18 h after transduction, washed, and injected in bulk via the tail vein along with 100 000 freshly isolated supporting cells from whole BM. The transduction efficiency obtained was between 10 and 15% of the transplanted cells, as determined by FACS analysis of GFP on in-vitro cultured cells, 2 days after the transduction. Recipient mice were irradiated as described above and transplanted mice received Ciprofloxacin with the drinking water throughout experiment. Human cord blood was collected following normal pregnancies and deliveries upon informed consent of the parents, in accordance with the ethical committee of the IRCCS Policlinico San Matteo Foundation and the principles of the Declaration of Helsinki. CD34+ cells from human cord blood samples were separated and cultured as previously described + progenitor cells were separated using immunomagnetic beads selection and cultured, for 13 days, in medium'>Stem medium'>Span medium (medium'>Stem cell; , ) supplemented with 1% L-glutamine, 100 U/ml penicillin, 100 ng/mL streptomicyn, 10 ng/mL IL-6, IL-11, 10 or 100 ng/mL rHuTPO ( EC , , ), and 100, 1000 or 2000 ng/mL AMG531 at 37°C in a 5% CO2 fully humified atmosphere. celltype'>MO7e cell line (Genetics Institute, Boston, MA) was cultured in Dulbecco’s Modified Eagle’s Medium (DMEM) supplemented with 1% L-glutamine, 100 U/ml penicillin, 100 ng/mL streptomicyn, 10% Fetal Bovine Serum (FBS) and 50 ng/mL GM-CSF ( EC ). After informed consent had been obtained, cord blood from healthy volunteers was collected into sterile heparinized tubes. Mononuclear cells were obtained by centrifugation on Lymphoprep density gradient. Ex vivo cultures were set up with cord blood MNCs at 3×106 cells/mL in medium'>StemSpan medium supplemented with 50 ng/mL thrombopoietin (TPO) (Sunshine Pharmaceutical Company Limited), 20 ng/mL interleukin-3 (IL-3) , 50 ng/mL stem cell factor (SCF) and 50 ng/ml IL-6 using 75 cm2 tissue culture flasks (Corning). At indicated time points, the cultured cells were harvested, washed, and prepared for immediate infusion.